Here’s a chance for you to get a Zippo with high-quality engraving done by me. Unique design, hand engraving, 2 days of love and labor to make the engraving, and all that jazz. This is a solid brass Zippo, model no 204B, brand new. Feel free to zoom in and see absolutely every cut I made there. I have 1 more Zippo in reserve, plus 6 in the shipping, that I’ll engrave in the future, so if you’d like to get special customized Zippo lighter just for yourself, then let me know. I’d be more than happy to make one! Just want to say I really love your engraving art work. I have done some engraving on Zippos before, but nowhere to the extent of your skill and detail. I would like to ask you about what kind of tools you used for engraving? Before I used GRS GraverMax SC with 901 handpiece, but as I needed to set up another workplace at my apartment, then I wanted to try Lindsay tool out. When I was engraving (going back a few years ago), all I used is a screwdriver and I use a grinder to make the point really sharp. I’ve never heard of tools like ones you mention before. Now I am defiantly getting one and get back into the art of engraving. hi i like your engraved jippo and i liked to buy it but i try to find it on ebay but its not there.anyway can i please take a second one like this.thank you. This Zippo was on eBay in October 2007, so its auction ended a long time ago. But I can make a new one, no problem. I’ll email you. Very impressive Zippo, better then any engraved/edged Zippo I’ve seen including Japanese Zippo’s. Out of curiosity; what would one of your engraved Zippo’s cost approximately? Michel, thanks for liking it! 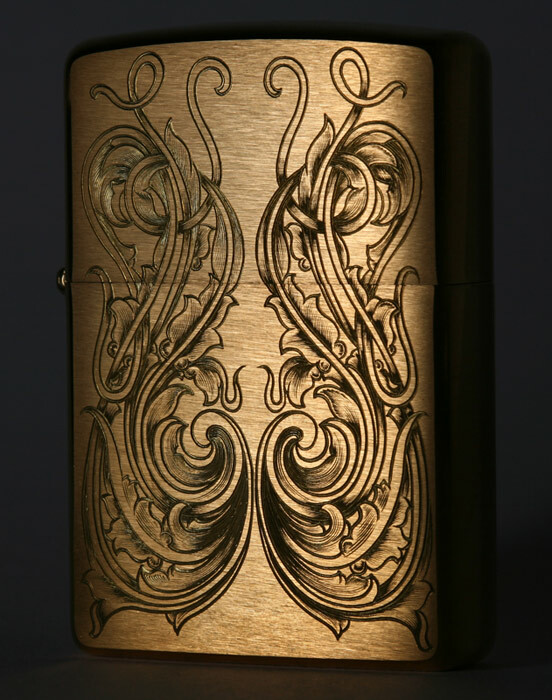 With design as complicated as this it costs around $130 USD, which includes Armored Brass Zippo and shipping to anywhere. Of course I can do custom design, then the price depends how complicated the engraving is. Jake, you, my friend, have a good sense of humor :). The bad thing about me is, of course, that I don’t want to go to heaven. What concerns the intricacy of the work, I must say that I’ve yet to see a machine that can do work as fine as humans can engrave. Yes the lasers can do pretty fine stuff, but they aren’t cutting the metal, just burning. Though there are some 7 or 8-axis CNC’s that can fool those who don’t know how to look at engraving and might look something like it’s hand engraved. But still no cookie. Humans can make stupid errors during engraving and then clean them up and make it look like it was supposed to be there. Try that with a machine. it’s hell a terrible you dont want to go to heaven cus by the looks of that Hillary Clinton god needs a good new artist but that is completely irrelevant so ill stop talking about that! and as for making mistake while engraving and making it look like it was supposed to be there well i dont know much about engraving but i think that aspect of art in general ends the same we cover it up to make it look like it was supposed to be there (I’m a musician and i do that almost too often)!! but i digress (this is why i like whiskey i annoy myself less with the talkin) as for a price well its true i am a very poor man so there isn’t much i could offer you but a few old instruments and as for money the most i could afford is 100 to 150 american dollars. i too have people to take care o and a lady in my presence who wouldn’t be to happy to see me spending more than 50 cents on something to me!!!!! it is definentlt the finest piece of zippo I ever saw. Thats amazing! I love zippos. I use my own I got the info and tools from http://www.ballchains.net and I do it automatically as a side business. I will bookmark this site and check it out again. Thanks!